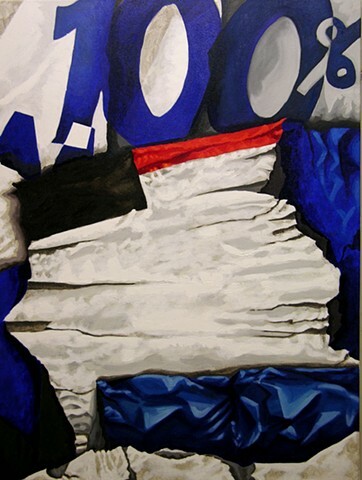 "100 Percent" is a new painting in the Trash Stacks series. Here I am working with some elements which are unconventional for me, working with text and graphics. I enjoy the landscape quality of these works and like to leave text out from these images as to not over complicate these images with textual information. "100%" was a fun work to make with the challenge of making the white spaces dynamic enough to be interesting while maintaining a level of simplicity as to not over power the image.